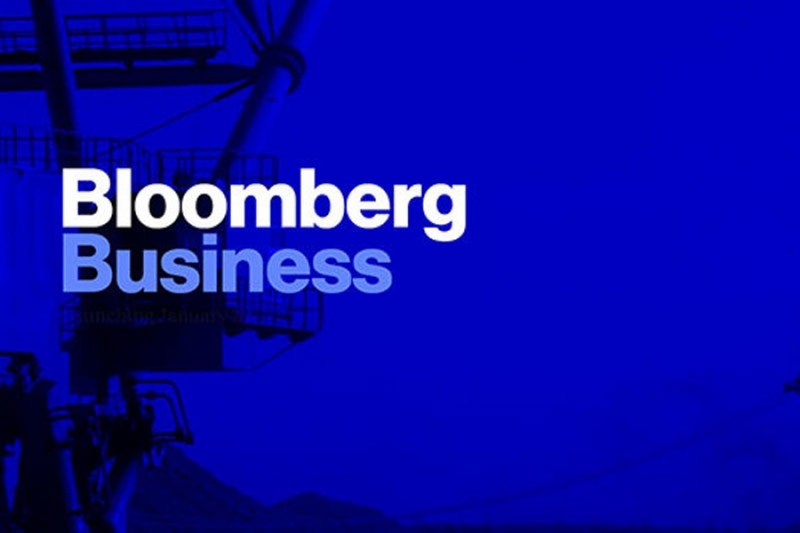 This post originally appears on Bloomberg Business. LONDON, UNITED KINGDOM — (Marketwired) — 11/17/15 — Enterprise Strategies, a consultancy committed to Delivering the Future of Work℠, through practical digital strategies and adoption programs, today announced the hiring of Lesley Crook as their Internal Digital Strategy Advisor. In this role, Lesley will work directly with Enterprise Strategies’s clients in the United Kingdom and Central Europe provide local support for internal digital strategy and enterprise social network adoption initiatives. Lesley brings over 15 years of internal communications and employee engagement experience to the Enterprise Strategies team. She is the founder of Working Out Loud in a Network “#wolan” helping organizations embrace the business value of enterprise social networks. 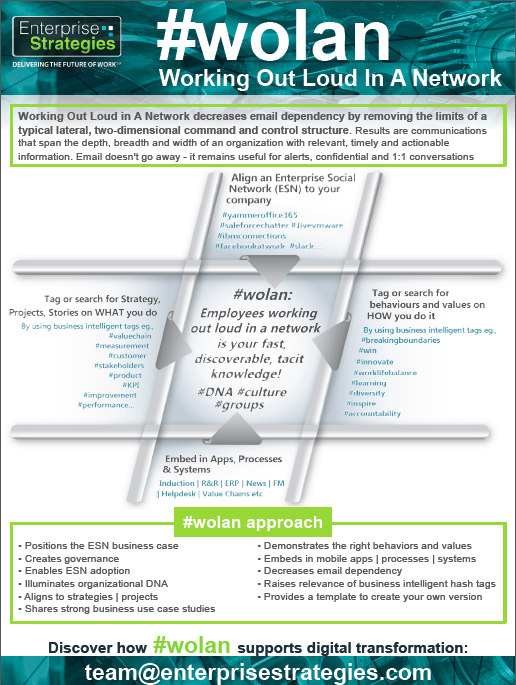 The #wolan framework demonstrates how enterprise social networks can be aligned to strategy, share tacit knowledge, demonstrate the right cultural behaviors/values and introduces the relevance of using “business intelligent” hashtags. The emerging #wolan framework convinced the GSK German Works Council to use Yammer. #wolan has been endorsed by the Digital Workplace Group, Oxford University social academics and Microsoft. Prior to creating #wolan, Lesley was an Internal Digital Communications Manager for GlaxoSmithKline, where she inspired employees to use Yammer to improve employee empowerment and engagement. Working in a mutually successful Internal communication and IT partnership, Lesley helped launch and adopt the company’s Yammer strategy. She also led many other GSK internal communication digital channel programs, supported the GSK Brand team, led GSK’s Yammer adoption and facilitated their monthly SharePoint governance board. Lesley’s GSK lean sigma/ESN #wolan approach can be found at http://enterprisestrategies.com/2015/11/16/demonstrating-yammers-business-value/. She was recently interviewed regarding #wolan in advance of International Working Out Loud Week (Nov. 16-20). A transcript of two interviews can be found athttps://wolweek.wordpress.com/2015/10/22/working-out-loud-in-a-network-interview-with-lesley-crook/. Lesley is a GSK Lean Sigma green belt practitioner, and earned a diploma with the Chartered Institute of Public Relations (CIPR UK). Lesley volunteers on the International Association of Business Communicators (IABC-UK) Chapter Board, and is an Enactus Business Advisor at Brighton University. She works and resides in Brighton, UK with her husband Steve and two terrier dogs. Enterprise Strategies is a consultancy committed to Delivering the Future of Workâ„ through practical digital strategies and adoption programs. 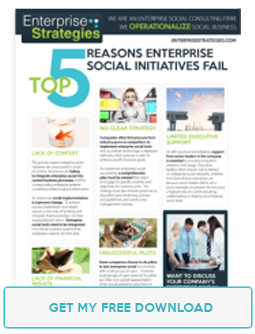 The firm has helped some of the world’s top organizations harness the power of enterprise social tools and processes. 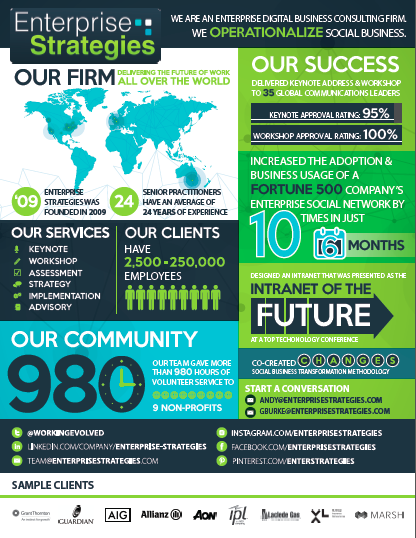 Founded in 2009, Enterprise Strategies is privately held and is headquartered in Indianapolis with senior advisors and clients around the world. 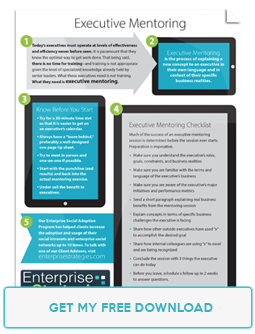 For more information, visit http://enterprisestrategies.com or follow on Twitter @WorkingEvolved.